The festive season is right here. Ticking the Bucketlist is ready to welcome Bappa with a guest post from a friend, who is an explorer at heart, a photographer by passion and a finance personnel by profession. 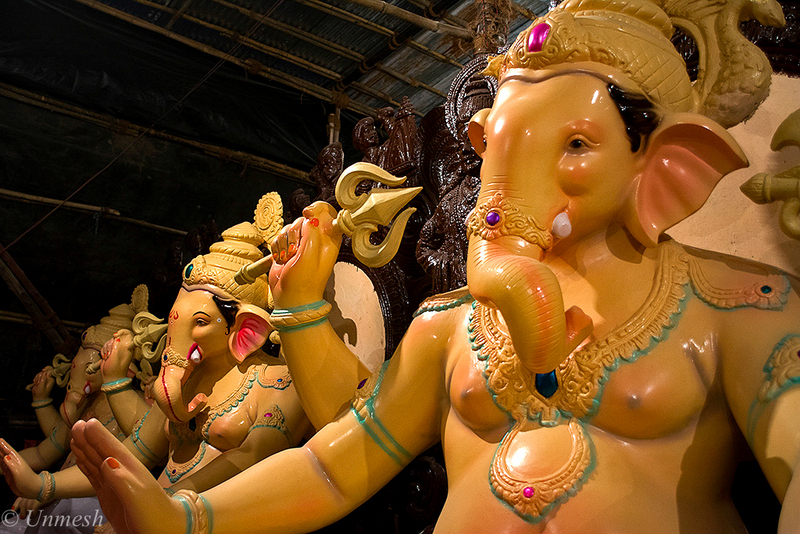 Read on to track Ganpati’s first journey – from the artist’s mind to the ‘pandal’ as expressed by Unmesh Sharma. The idea was simple. I had seen a lot of photos of Lord Ganesh / Ganpati in the ‘pandal’ (the temporary Marquee or structure set up during the 10 day festival of Ganesh Chaturthi) or during the time of ‘Visarjan’ (the procession which ends with the idol’s immersion in the sea). However I always wondered what happens in the run-up to the festival. While the Durga puja idol workshops (in Kumartuli) are well documented, I wanted to do a similar exercise for the Ganpati idols in Mumbai. I therefore decided to document that the journey from the time the idol is conceptualized to the installation in the pandal. 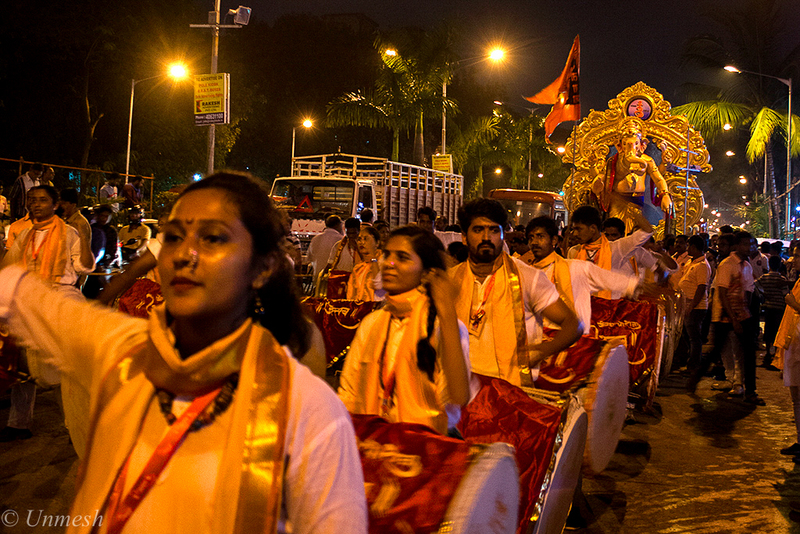 Every year, in the run up to the 10 day festival of Ganpati, hundreds of artisans from around the country descend into Mumbai. 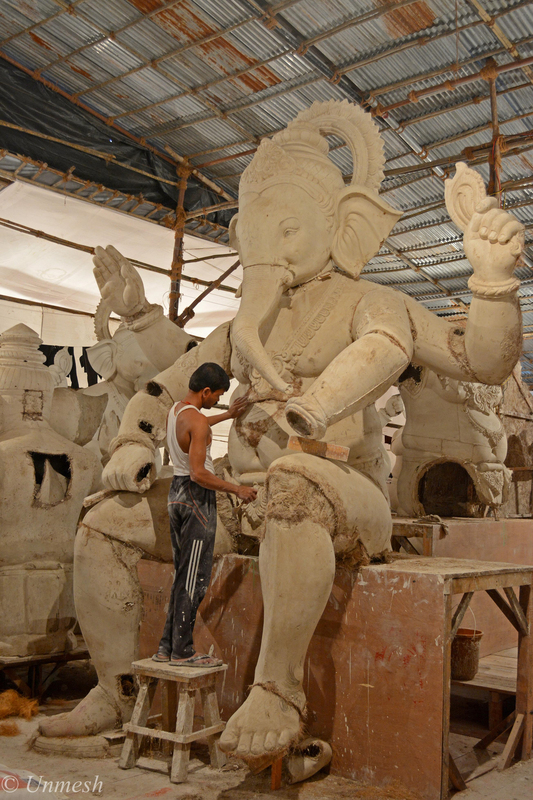 They occupy large grounds to set up temporary workshops for building Ganpati idols. One of the largest such workshops is located on the Railway grounds at Parel. This is just about a kilometer from the pandal for Mumbai’s most popular and beloved Ganpati – Lalbaug-cha Raja (literally- ‘the King of Lalbaug’). To capture the procession for the idol from the workshop to the pandal. I made my first visit in late July. This workshop is quite awesome- as is typical of all things in Mumbai- large, chaotic, full of life and 24×7. The idols made here can be anywhere between a few inches to over 30 feet tall. The place was also full of surprises. As I wandered around taking photos on my first trip, I heard some artisans talking behind my back. “He is using a prime lens not the kit lens which everyone uses”. Maybe it was just a false sense of superiority complex, but I was actually not expecting to discuss the technical details of photography with an artisan- especially one whose hand were covered with plaster of paris and head covered with a piece of cloth. There I met Abhijit, a young fellow- late twenties who could speak in impeccable English. I struck a conversation with him- he mentioned that he lives a few kilometres away and was working there to learn the trade. He has his own e-commerce website and FB page called WitchKrafft, where he sells handicraft and pottery items made by him, his friends and local artisans. This was the perfect location for him to learn the use of clay, plaster and paper from the best artists. He also mentioned that he had learnt to play the guitar in his spare time and the gigs in local restaurants gave him extra income in off-season. A guy who had decided to take life by the scruff of the neck and work his way up the hard way- his sleeves rolled and a smile on his face. Absolutely heart-warming. However most artisans were not like him. They seemed like people from rural areas- mostly north India. I spoke to one of them as he emerged from inside a massive Ganpati idol under construction- large enough to accommodate 2-3 full size people. He mentioned that he is from Bihar and comes to Mumbai every year for the festival. He is a plaster of Paris specialist and gave me some insights on how the idols are built. One of the thoughts I had in my mind right from the start was how environmentally friendly these idols are. He told me how people have turned a lot more conscious about this in the last 5 years and now demand biodegradable materials. 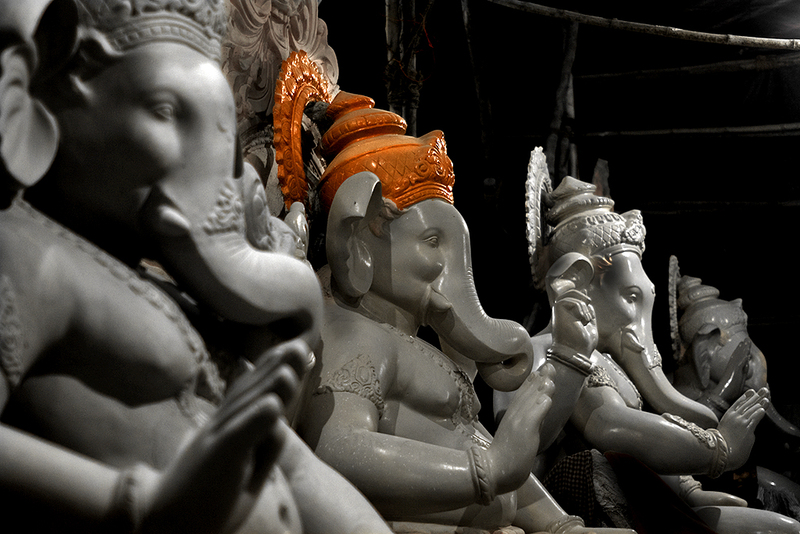 Many smaller idols are now made from clay, paper and sometimes even plain mud. In fact, there is now a growing trend of people who don’t even immerse the idols into the sea. 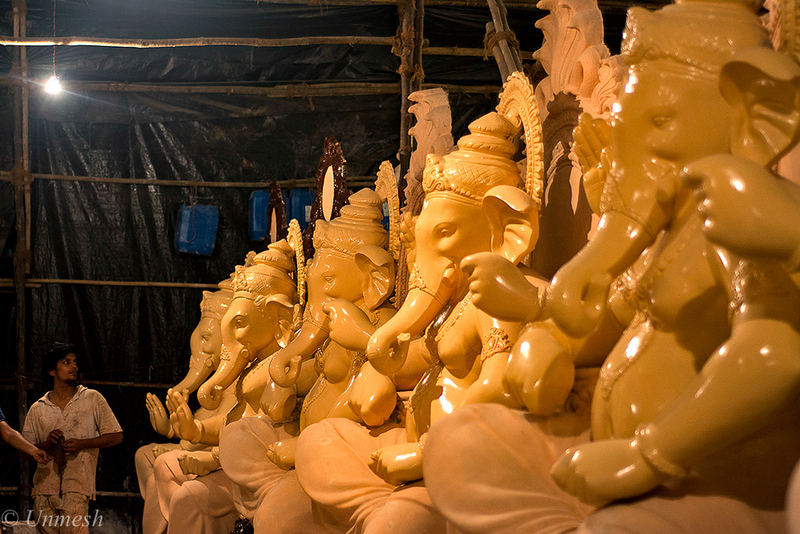 There is a workshop in Lower Parel (Mumbai) where the artist builds small idols from just mud. He then adds seeds of Tulsi (holy Basil) and paints the idols with natural paints. Once the festival is over, once can just immerse the idol in a pot full of water and in 2 weeks, the holy basil starts to sprout. Of course this is a lot tougher for the larger idols. They need a metal frame just to support the weight. However here too there is a lot of improvement, the materials have got lighter reducing the metal usage. There is also a shift to carbon fibre which along with the frames are recycled. However the biggest change in the last 5 years has been the paint. Government regulations, environmental activists and increasing awareness have meant that paints are now mostly biodegradable and chemical free. I had read somewhere that artisans from Bihar also dominate the workshops in Kolkata. I asked a few of the artisans if they also travel to Bengal post this festival to work for the Durga Puja Festival. They mentioned that all depends on the ‘season’. If they make enough money here (which it looks like will be the case this year), then there is no reason to do that. “The money and working conditions in Mumbai are far better”. They also told me that the artisans are mostly specialists, with just a supervisor and the chief artist as the central coordinator. The least skilled ones work on basic tasks such as mixing plaster of Paris and body parts such as the stomach and legs. The ones who are in the intermediate skill level work on the more complex body parts such as the hands and the face. The artisans at the top of the chain are the ‘finishing’ artists – these are the most sought after and best paid. 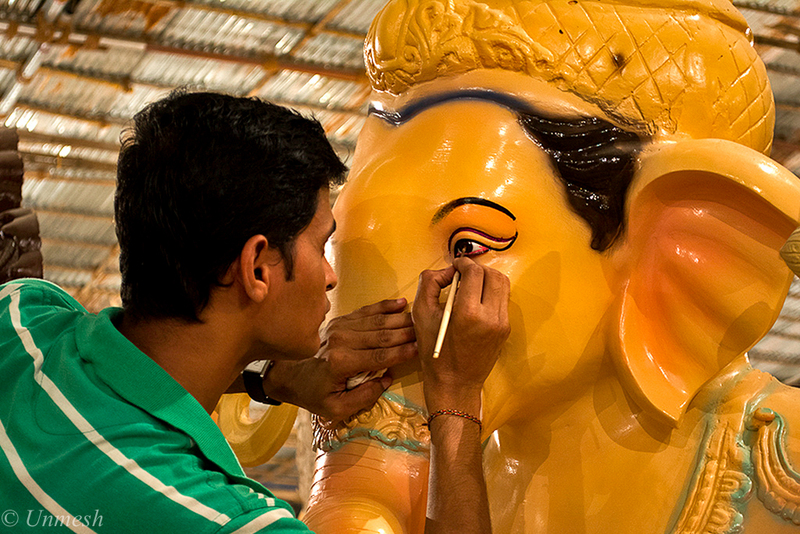 The most notable task, which is often personally supervised by the chief artist is the painting of the idols eyes. The artisans tell me that it requires a great amount of skill to convey an intense and yet calming expression. This is visible in the best idols. And the eyes play the most important role. Indeed, legend has it that once the eyes of the idol are painted the idol becomes a true image of God. 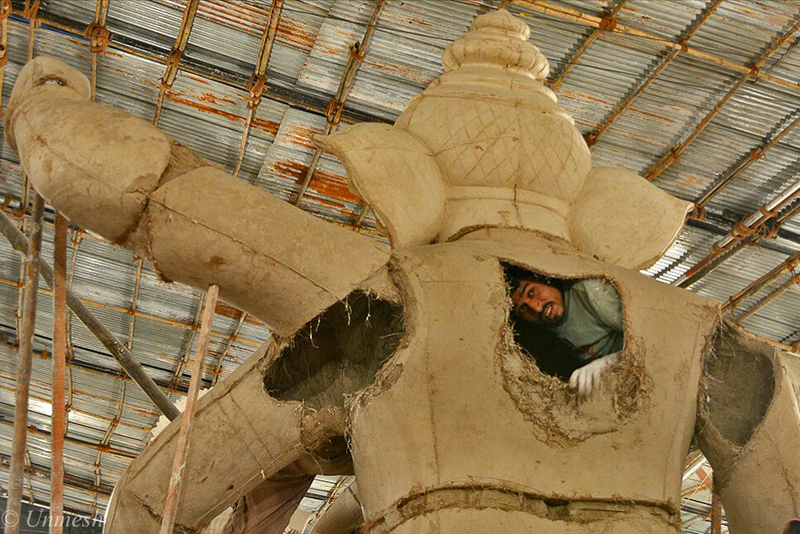 Once this process is over, the idol can then be transported to the pandal. Over the last half a decade, this has become a far more elaborate process. With the number of pandals increasing manifold, the police has started to request the pandals to stagger the processions to carry the idols from the workshop over two to three weeks. In many cases the idols are so large that the pandals are built around the idol rather than the idol being brought in post construction. 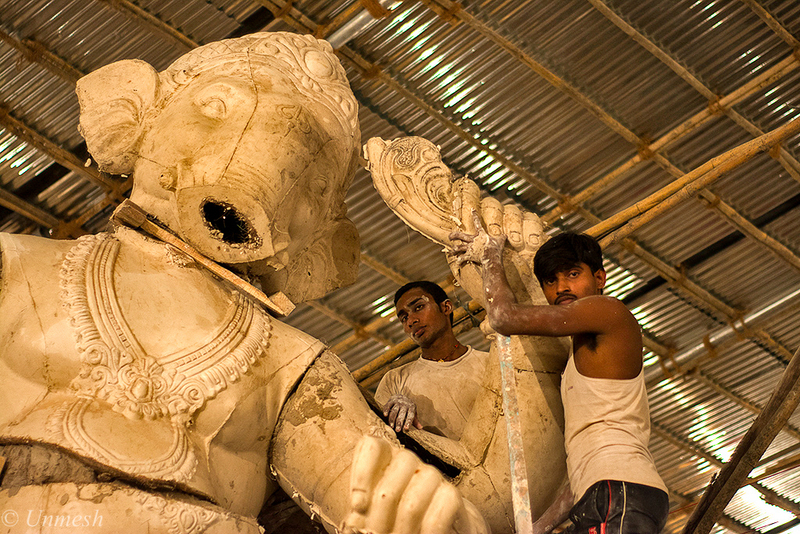 In late August, I visited the workshop as one such procession carried the 20 foot idol from the workshop. Of course as is typical with all festivals, a whole song and dance was made around this. The procession had many musicians- most of them playing drums of various sizes and one very large metal cymbal. This is popularly known as the ‘Nashik Dhol’. In case you wish to visualize this, just imagine that the elaborate procession for Visarjan except that it ends at the pandal rather than the sea. The musicians in this case were from Pune. However I also noticed other troupes of musicians waiting for other idols. They were from various parts of the city especially Dadar and Thane and from outside the city – mainly Nashik and Pune. If you wish to see the true traditions of Maharashtra, look no further. Women are actively involved in this- they bang the largest drums- almost going into a trance at times. And doing this on their own terms- wearing full traditional jewellery (including the elaborate nose rings) and make-up. This tradition goes back to the time of the Malwa and Maratha kingdoms. The story of Ahilyabai Holkar of Indore is well known. However the most notable is from when Shivaji Maharaj ruled the Maratha Kingdom. His mother (Veermata Jijabai) played a seminal role in his development into the fearless warrior king we know. It is said that God made man in his own image but then at the workshop, I wonder if it is indeed man who makes God in his own image. Either way, these images depict what I love about this festival. People from all walks of life come together to make the festival what it is. The idol frame may have been made from a artisan from Bihar, the paint may have been applied by someone from Bengal while the eyes may have been painted by someone from Maharashtra. 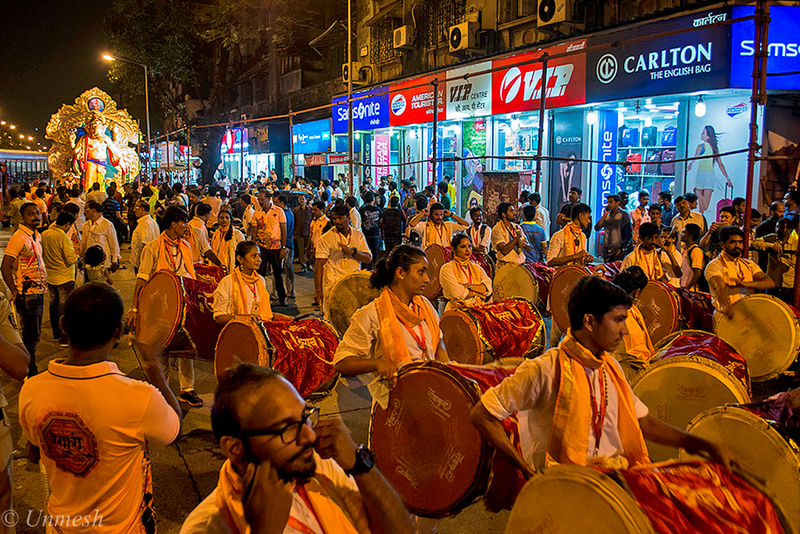 The procession had men and women from Pune and Thane while Mumbai-kars dance to the beats on the ‘Nashik’ dhol. The songs played by the DJs in the pandals singing Bappaa’s praises (‘Hey Ganaraya’ and ‘Riddhi Siddhi’) could be from movies directed by a Christian, choreographed by a Parsi, music directed by a Muslim and lyrics written by a Hindu. But Ganpati Bappaa does not differentiate between us…Thank God Bappaa Applya-saarkha nasto”. Thank God Ganpati Bappa is not like us! Many thanks to Unmesh for this post. This is a guest post and all copyrights continue with the author Unmesh Sharma. Wow, how fascinating! When I went to Bali, my husband and I ate at this popular seafood restaurant called Ganesha Cafe, and that’s how I came to know about Ganesh. I’m so amazed at the idols that are over 30 feet tall! Wow! I bet so much work was put into that. But good thing that they are made from biodegradable materials and that the process is environmentally friendly. This looks like a great festival! What a beautiful description of this festival in India, I want to go next time! What I really like is that the process is described, things you often do not know if you only experience the festival itself. It must be so impressive to watch the women almost go in trance, amazing. Wow, that’s insane that she got such a behind the scenes look! Meeting with the locals is always the best part of traveling. Man, and those giant sculptures! That’s just awesome! 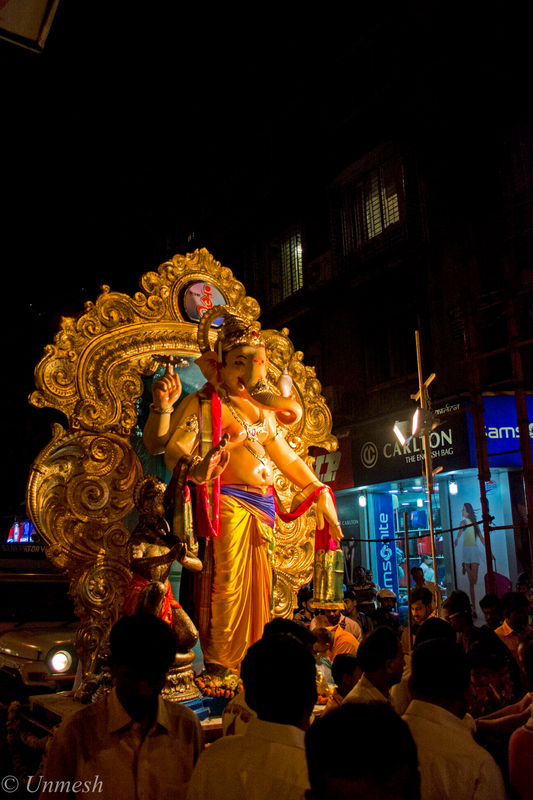 I have to agree, while the process of Kolkota Kali is well documented, it isn’t so in the case of Mumbai Ganpati. And yeah, to see how magnificent the celebration is, Mumbai is the place to go. Here in south, its mostly much small clay idols which we generally immerse in our own wells! Woow.. I always wondered how they made such huge idols of Ganesha. It is good to know that people are becoming conscious about the environment and started using mud/clay idols, pop still dominated the making of huge idols. However, it is a positive sign that they are using reusable frames for the idols. As for me, I make an idol all by myself every year using clay and then after the festival, I use the clay for the plants. 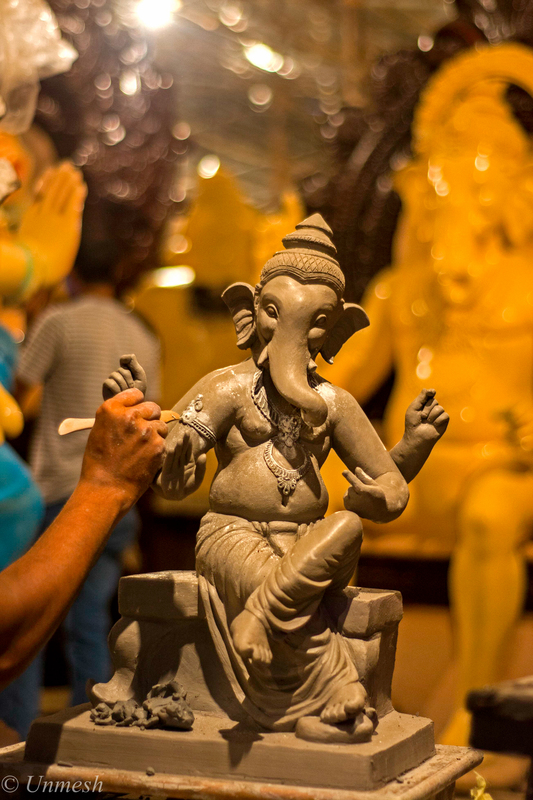 I visited a similar workshop in Tamil Nadu and was in awe of how much time, effort and detail go into every idol! They weren’t as environmentally conscious as those mentioned here, but the whole process was very similar, I like that there are a lot more purely clay models these days, and that the paint is mostly environmentally friendly as those kind of things are getting more and more important! I’ve always been fascinated by these festivals as they provide the best glimpse into a city’s culture. The effort, talent and number of hours that went into making each of those idols blew me out of my mind! You’re so lucky you get to have an insider’s look into these workshops! That must’ve been more amazing to see that transform before your eyes. Wow there is so much skill that goes into making the idols. I would have never guessed they were so meticulously made! I love the fact that the eyes are the most important part!